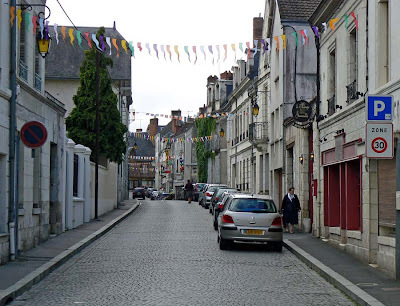 This street was originally called the rue du Pont (Bridge Street) because it leads up from the bridge into town. Joseph Paul-Boncour was a native of St.-Aignan who became a lawyer and a politician and served in various ministerial posts in French government between 1911 and 1938. He was a French senator and a prominent socialist. Looking up into the rue Paul-Boncour from the river near the bridge with the collégiale in the background. This is the street that cars take to go up into town and to the main square, the church, the château, and the post office. On market days, through traffic is forced around town on the ring road, but local traffic can still drive in. On festival days, the street is closed to all traffic. That only happens about twice a year. Outdoor seating at Le Mange Grenouille. 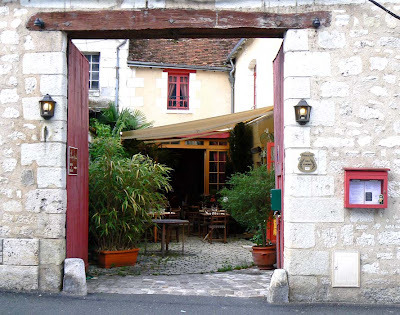 A few years ago, a little building with a courtyard was renovated and turned into a nice restaurant called Le Mange Grenouille (roughly translated as the Frog Eater). Not surprisingly, they serve frogs' legs. Ken and I have eaten here twice. It's a bit too fancy and upscale for frequent dining, at least for us. The rue Paul-Boncour climbs up into town. 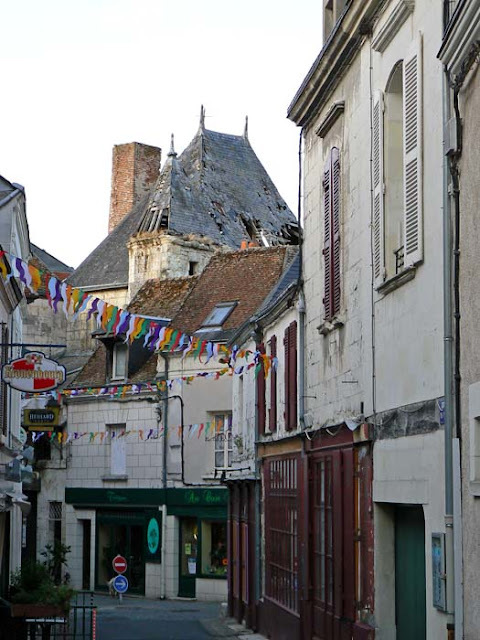 At the end of the street, where it intersects the rue Constant Ragot, is one of the few remaining medieval buildings in town, complete with exposed timber frames and red brick. I can't find anything much about the building, but it's typical of the town's buildings from that era. A reminder: most of these pictures look a lot better in their larger size. Click on them to see, then use your "back" button to come back to this page. 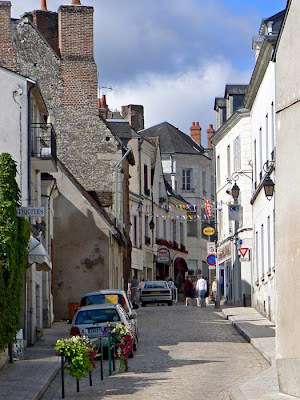 When we bought our house near St.-Aignan in 2003, the woman from whom we bought it left us all manner of papers and files about the house, the town, and the surrounding area. Among the stuff were a couple booklets about the history of St.-Aignan, published in the mid 1980s. It is from these booklets that I'm getting some information about what's in these photos. 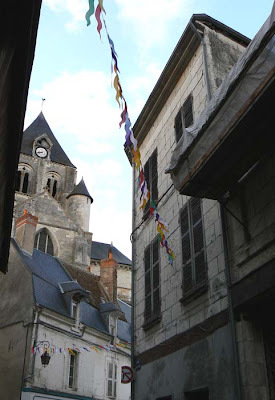 The rue du Four and the roof of the présidial, 2009. This brings me to this picture of a rather impressive slate rooftop right in the middle town. It's nearly in ruins, which is too bad, given that it's visible from the market square. I took the photo on our way to the café, le Lapin Blanc, which is on the rue du Four (Oven Street). 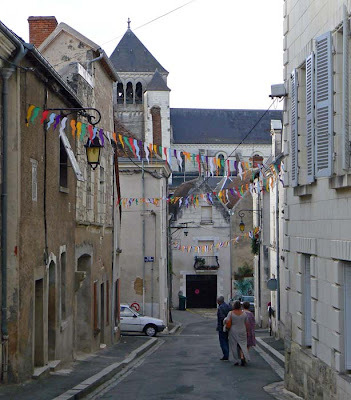 The street is so named because it was the site of St.-Aignan's public ovens, very near the markets in the center of town. Eighteenth century engraving of the rue du Four and présidial. One of the booklets includes an engraving of this very view dating from the eighteenth century. It notes that the building was a présidial, some kind of official place where local matters of law (the king's law) were decided. There's no other information about the building that I can find. St.-Aignan's main street, rue Constant Ragot, is one way southbound through town. It starts at the river and climbs up the left bank of the Cher, meets up with rue Maurice Berteaux at the Place du Président Wilson, then changes names and heads southward out of town. Looking south from the river into town. We moved here in 2003, and that year this street was dug up for reconstruction. The town tore up the old asphalt and repaved with cobblestones for a more old-timey look. They put in new bollards, benches, and planters as part of the job. The result is pretty nice looking. The street is closed to through traffic on market days, but local traffic can still use it. A couple times during the year there are larger festivals that close the street entirely so it can be lined with booths and exhibits. Looking north toward the river into the town center. Part of the town's old wall is visible on the right. This would have been the location of the town's southern gate. 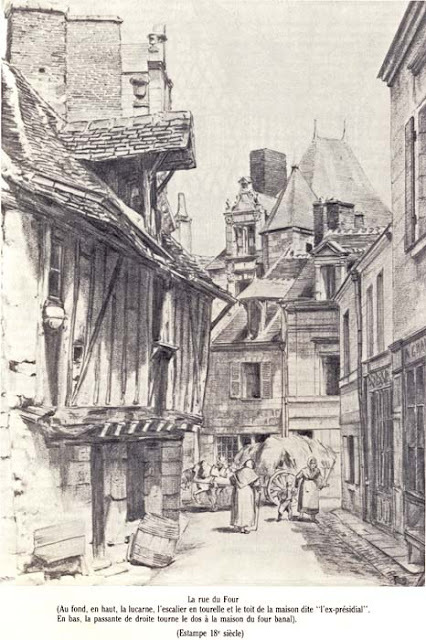 In St.-Aignan's medeival history, the street was actually three streets. The first, starting at the river, was called the rue du Cher and is what you see in the top photo. The center section was called the rue de la Boucherie owing to a (now gone) building that housed a butchery. The third section continued southward to the town gate and was originally called the rue Baudon, but was renamed the rue Saint-François in the seventeenth century. It's what you see in the bottom photo. These old street names existed through the nineteenth century, and have only changed in the last one hundred years. If my research is correct, Constant Ragot was a local hero of the resistance during the second world war. Remember when I mentioned that there's a little ring road around St.-Aignan? It goes around the eastern side of town so that northbound traffic can get down to the river and over to the bridge to continue north. The town's main street is one-way south. The two-way ring road, rue Maurice Berteaux, with absolutely no traffic. It was a holiday, after all. Looking north with the town center on the left. But the little ring road is a two way street. Through traffic is encouraged to go around town rather than through it because the little southbound street is narrow. Trucks are required to use the ring road. I suppose calling it a ring road is a bit of a stretch. It's just a normal street that was built on a filled-in drainage ditch (like a moat) that existed in the town's medieval history and which bypasses the town center. Before it was named for Maurice Berteaux (an early twentieth century French Minister of War), the street was known simply as the rue des Fossés, or Ditch Street. More of St.-Aignan's collégiale church, this time seen from my comfy seat at the Lapin Blanc. Did I mention that we were sipping wine? And eating a pizza? And laughing a lot? The collégiale viewed from the Lapin Blanc. I'm glad that so many of you have mentioned that you're enjoying this St.-Aignan series. Even though this isn't the town we live in (we're right next-door), we spend a lot of time here. No, not in the café, but running many errands. And I don't often take the camera with me, so I found I don't have many photos of the place. Our doctor and dentist are in St.-Aignan, as is the pharmacy we go to. There's also a branch of our bank, our insurance agent's office, a post office, a jewelry store where we get our watch batteries changed, and a couple of gifty-type stores we visit when we need something gifty. Then there's the Saturday market, the little superette with the charcuterie, the two butchers (both of whom we visit from time to time), our Super U supermarket, an Ed discount grocery, a small electronics/appliance store, a couple of florists, a Mr. Bricolage hardware store, and the car dealer from whom we bought our little Peugeot. We've eaten at at least six of the town's restaurants, including the pizzeria and the little crêperie. And we've visited most of the cafés and bakeries in town, but we're not what you'd call regulars at those establishments. Just writing all that down makes me realize that little St.-Aignan actually has a lot going for it. I did take the camera with me on Saturday morning and walked around town taking snapshots. Pool Party. 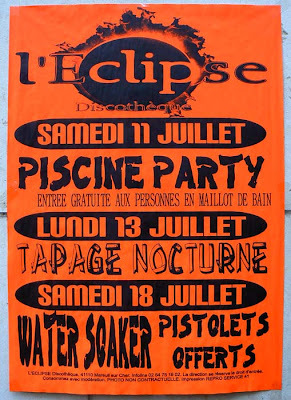 This sign was on the wall of the Lapin Blanc café, right behind where we sat on Bastille Day. I couldn't resist a photo. * These are my best guesses. I've never been to any of these events. If I've got it wrong, please let me know! I have no idea what this beverage is. It's in a beer glass, so I tend to think that it's a) some kind of beer, or b) beer with something red added to it (a beer kir?). It looks like beer, foamy head and all. It's just red. Anybody out there know what it is? Red beer at the White Rabbit. 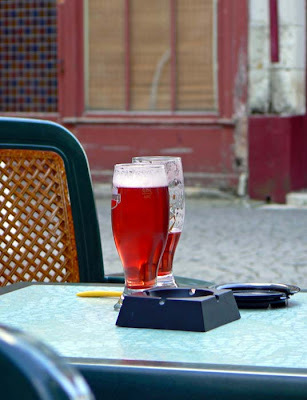 The point of our walk in St.-Aignan on Bastille Day was to go have a drink at one of our local cafés, le Lapin Blanc (the White Rabbit). We sat and had white wine, along with a pizza from around the corner. They guys next to us were drinking this stuff. I didn't ask what it was, but I should have. After a couple glasses of wine, our friend M.-J. treated us to a surprise: a little glass of calvados (apple brandy) for me and a little glass of poire (pear brandy) for Ken! Merci! Having grown up in the United States, I never really noticed doors and windows until I came to Europe. To my eyes, the doors and windows here are often little works of art. Even the most plain, like this one in St.-Aignan, can be beautiful. The variety of wood, color, patina, hardware, and stonework is nearly infinite. 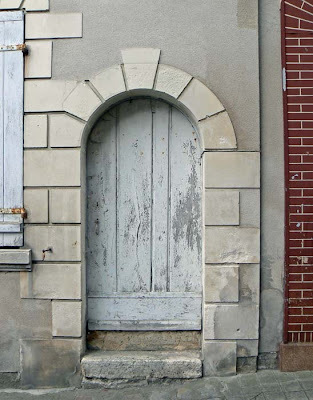 A rounded door, shut tight. When I returned to the States I started noticing the artful doors and windows there, too. Of course, they were there all along, but for some reason I never paid them any mind. Some people make a specialty of photographing doors and/or windows. I've seen posters made up with collages of door photos. I'm certain there are door and window coffee table books. I have my own little collection, too. But it only exists piecemeal; I've never tried to organize any of it. Maybe that will be a project one rainy winter day. Unfortunately, this bakery shut its doors for good a couple of years ago and no one has come in to re-open it. 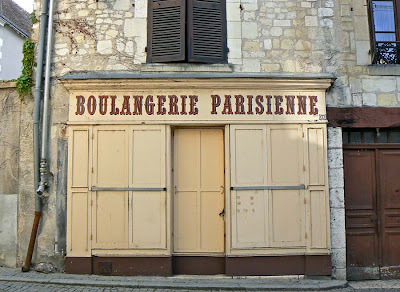 This is the second bakery to close recently in St.-Aignan. Fortunately, there are three others that seem to be doing fine. Not to mention the two in our little town next door, and the several across the river. The now defunct Parisian Bakery. Still, it's hard to watch businesses fold. Two charcuteries in St.-Aignan also closed recently, leaving the town with just one, and that one is inside a small superette. But it's run by a local guy and he does good stuff. There's a great charcuterie across the river in Noyers. And, of course, there are a few at the Saturday market, too. Otherwise, the big supermarkets are taking the business. There was also a small bookstore in St.-Aignan until it, too, closed. The woman who ran it was struck and killed by a car a couple years ago and the store had to close. It's never re-opened. St.-Aignan does have two very good butchers, and there are frequently lines out the door at both shops, so we hope they'll stay around. This is just another view of St.-Aignan's church, known as the collégiale, from the center of town. A collégiale is called a collegiate church in English. It hosts a college of canons, a non-monastic, secular group of clergy (I got that from Wikipedia). Narrow sidewalks in central St.-Aignan. In this photo you can only see one of the two bell towers on the church. The current building was constructed on top of the original church, built on the site in the tenth century. What's left of the orignial church is now the crypt below the newer building. It's open to tourists and contains some interesting frescoes. The sign in this image means "no parking" to the right of the sign. 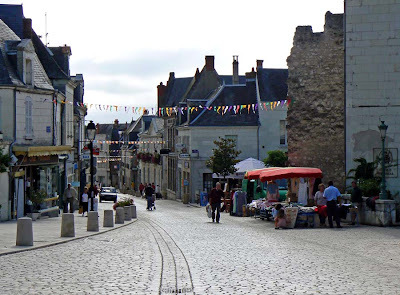 From any of the small parking lots around St.-Aignan, it's a short walk into the center of town. But it will be either an up-hill or a down-hill walk (and vice-versa for the return) because the town is built on the slope of the river bank. One of the collégiale's bell towers seen from the streets of St.-Aignan. There are two prominent landmarks in St.-Aignan. One is the Romanesque church, or collégiale, that's just a block off the central square. It has two bell towers that stick up over the roofs of the other buildings in town. The other is the château, built on the highest bluff above the river, and right next door to the church. Most of the medieval parts of the château are gone, but there are some remnants. The rennaissance wings of the château are intact. In fact, they're lived in! Route not advised. This sign says that recreational vehicles are advised not to use this street. The reason is that the street is very narrow and negotiating it in a large vehicle would be difficult. It's hard enough in a small car. 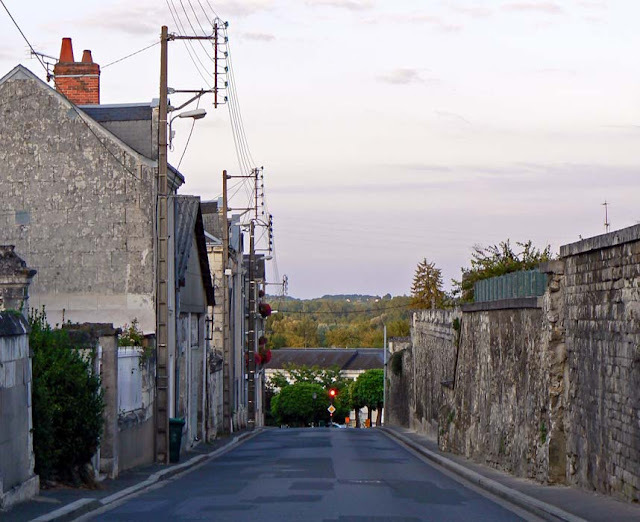 The center of St.-Aignan dates from the middle ages and the streets are small, twisty, and barely wide enough for a small car. They are mostly one-way and parking is very limited. The main square of town serves as a parking lot every day except Saturday when it's taken over by the market vendors. There is a main street through town, one way southerly. The northbound traffic is routed around the outside of the center on a little ring road that follows what I presume to be the footprint of the former wall around the town. 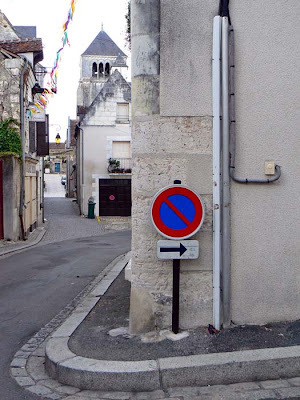 There are three traffic signals in St.-Aignan. Two are on the main road along the river, at the bridge and at the point where the little ring road intersects it. The third is on the ring road, about a block up from the river. Language note: In French, accents are optional on upper-case letters. That's why you see the accents in my title, but not on the sign. When words are spelled in all-caps and not accented, you just have to know how to pronounce the word without benefit of the accents. See, once again, how easy French is? 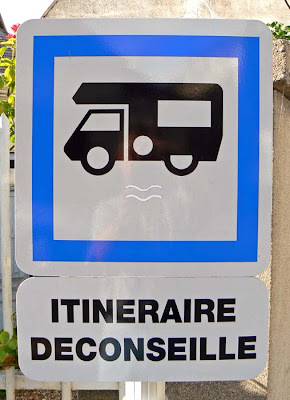 An interesting side note: The pictogram above is normally used to indicate a spot where RVs can dump their, um, waste tanks. Normally there's an arrow below the vehicle indicating the direction of flow of the waste into a below-ground tank. But for the itinéraire déconseillé use, the parts of the sign below the vehicle are missing or whited out. Ok, I promise: Tomorrow's post will have actual buildings in it! 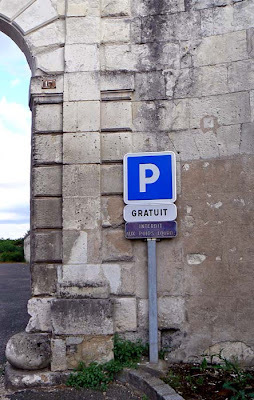 If you're not familiar with French, here's a language lesson: French for "parking lot" is le parking. See how easy French can be? Public parking lots (or garages) are always marked by the big white "P" on a blue square. This is one of the lots in St.-Aignan. It's just outside of the center of town. Cars entering and exiting the lot, as well as pedestrians doing the same, have to negotiate the arched entry. The arch opening is exactly one car wide. Under the "P," the signs read Gratuit (free of charge) and Interdit aux poids lourds (no big rigs). This lot gets a workout on Saturdays, which is market day in St.-Aignan. 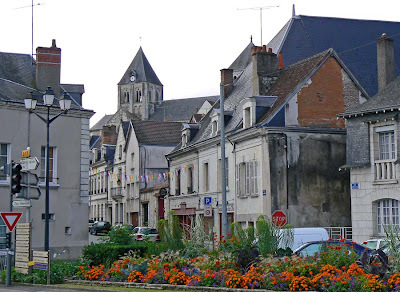 We live in a very small town in the Loir-et-Cher département, which is located in the region called le Centre. The population of our town is about 1,000 people. Next to us is the larger town of Saint-Aignan-sur-Cher, with a population of about 5,000. A tourist map of St.-Aignan-sur-Cher. This past Tuesday, we went into St.-Aignan for an evening drink with our guests from Normandy. It was a lot of fun sitting in a café in town and people watching. After our drinks, we took a short walk around town and snapped some photos. And lucky (or not) for you, I'm going to post some of those photos over the next few days! 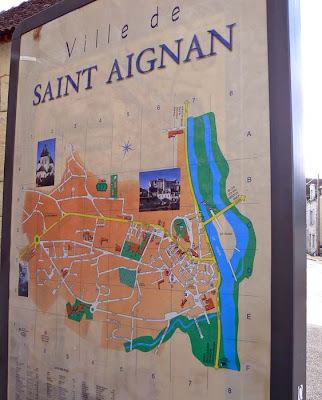 This first one is a map of St.-Aignan. I couldn't take the picture straight-on because there was a huge shrub growing in front of the sign. Not very practical, eh? Sunflowers. Summer is the time of year for sunflowers, and many of the farmers around our area plant whole fields of them. I believe that they're harvested for their seeds, which are processed to make oil. We use a lot of sunflower oil at our house. It's really worth clicking on this photo to see it larger. On Wednesday we were on our way to Vouvray to buy some wine and we passed several large fields of blooming sunflowers. Ken stopped the car so that I could snap a few photos. The flowers are a beautiful sight to see; fields full of brilliant yellow. We notice that the farmers rotate their crops each year. One year they might plant sunflowers, the next corn, then colza, then maybe wheat or barley, and then back to sunflowers. And there are always some of each somewhere. It's a constantly changing show, year after year. Acres and acres of sunflowers. And while you might normally think of sunflowers as a Provençal crop in France (à la Van Gogh), they obviously do well up here in the Touraine region, too. In fact, like many of our neighbors, we planted a row of them in our garden. But ours haven't opened yet. I'll be sure to post pictures when they do. I really have no idea what this is. I don't recall what the flowers looked like that preceded these berries. 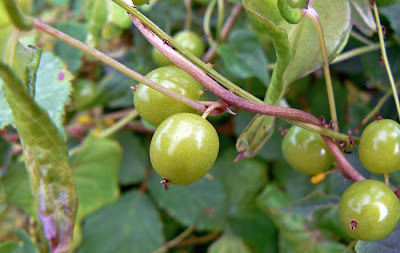 The fruit is a little less than a centimeter in diameter. These don't seem to be as abundant as other things out around the vines. It doesn't look like anything that I've seen people eat, so I'm thinking that the birds and deer get them. Of course, I could be completely wrong. They may turn red later in the season, or not. I know they're not groseilles because they're too big, not to mention that the groseille season is pretty much over now. So the mystery remains, unless one of you recognizes them. 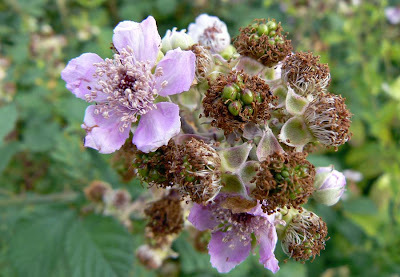 Blackberry blossoms with fruit forming. The blackberries that grow wild out around the edges of the vineyards and woods are in full flower now. Some even have fruit beginning to ripen. Great food for birds, deer, and intrepid humans willing to brave the thorns and bugs to pick berries. Oh, and today is la fête nationale, know to us Americans as Bastille Day, in France. Our town, like many others, held its fireworks display last night. It's the last day of a four-day weekend, unless you are a juillettiste and are still on vacation. Here's another wildflower that is abundant in the vineyard during the summer months. 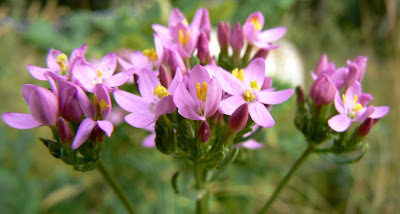 And it's yet another wildflower whose name is unknown to me. The flowers close up overnight and re-open each morning. Pink flowers opening in the morning light. Our weather has taken a turn toward fall-like. It felt chilly the last few days and it's been very dry up until Sunday. We've been getting a flow from the northwest -- the North Atlantic -- that has chilled things down from the weeks-long heat of mid June. High pressure is building up slowly from the south, but it's not yet strong enough to push the North Atlantic flow back up toward the British Isles and Scandinavia where it belongs. So here we sit, under the clouds. At least the temperatures are climbing back up. We're wearing shorts and t-shirts again. This kind of weather is not unusual; it happens every year. The difference lies in how long it lasts. 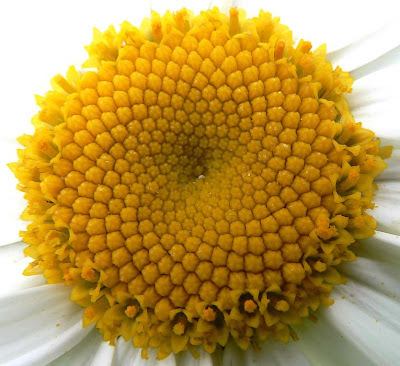 Yellow daisy-like flowers grow in the fields all around us. They're very common. These are growing on the edge of what was once used as a horse and donkey paddock out behind our house. The barbed wire encloses the paddock. 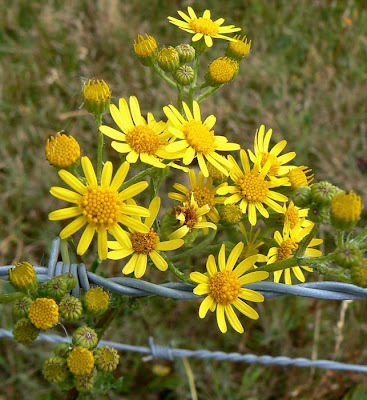 Yellow daisy-like flowers with multiple flower heads. When we first moved here, the paddock's owners kept a horse and a donkey there. One day the horse disappeared. A couple years later, the donkey was gone, too. But we still hear the donkey braying (is that what donkeys do?) in the distance, so they must have moved him closer to their house. Now the paddock grows wild. In other words, it's not being grazed any more. Once in a while someone will mow it down, so there are no shrubs or trees encroaching. But it's full of wildflowers, like these, and that makes it beautiful all summer long. I have no idea of the name of the plant that produces these black seed pods, but they are appearing around the vineyard right now. 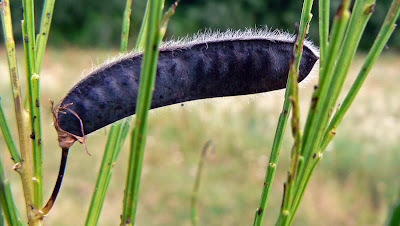 Dark seed pods among the summer green. The stems look similar to something called prêle, but I don't think that's what it is since the corresponding leaves are missing. Whatever it's called, I think the contrast between all the summer green and the dark pods is quite nice. Wild chicory. This stuff grows in all the fields around us. When they're not mowed down, that is. The blue flowers are spectacular and they just scream "summer" to me. 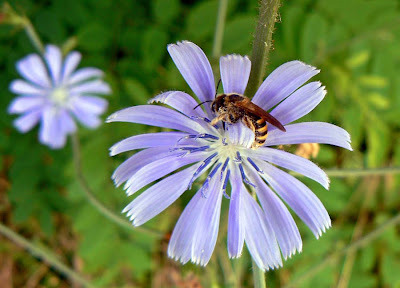 A bee visits a wild chicory flower on the vineyard's edge. I remember wild chicory from my childhood in upstate New York and had pretty much forgotten about it during my time in California. When I noticed the tell-tale blue flowers here in France they brought back memories of those endless summers as a kid out in the country. Lots of flowers spark memories for me. It's like how hearing an old song can transport you back in time. 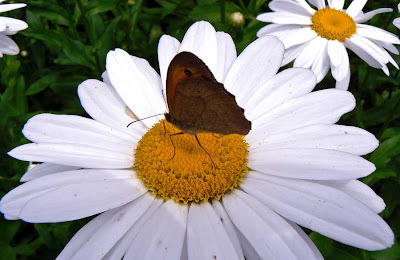 I remember goldenrod and Queen Anne's lace like that, too. Magnolias remind me of the days I lived in Washington, DC. And yuccas and cactus remind me of trips to southern California. Do you have flower-related memories? As I mentioned earlier, last Saturday morning brought some high clouds and I carried the camera out in the vineyard to take advantage of the good light. I took photos of not only the clouds, but of some of the summer flowers that we're now seeing out among the vines. The vines are being pruned back now to limit leaf growth and favor the grapes. The next few posts will be of those images. In some cases, I've learned what the flowers and plants are called (mostly thanks to my readers). Otherwise, I haven't a clue. So I still appreciate your helping me out with their identification! 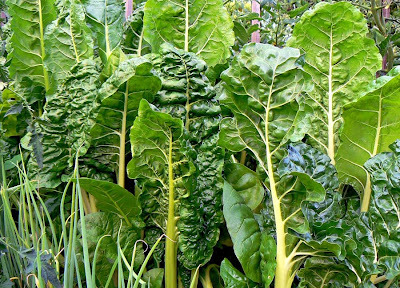 Silverbeet or Swiss chard. We've been talking an awful lot about chard lately. That's because this is the first year that we've planted it in our vegetable garden. It's been an undeniable success and we're eating batches and batches of the stuff. Swiss chard growing in our garden. These leaves are about two feet tall. It's real good cooked up and served like fresh spinach, but that's just the beginning. Ken has made it with a mustard-y cream sauce, which was very nice. I've baked it into an eggy quiche as well as a more chard-y tart. We used only the stems one time to make a tomato and cheese gratin. On Monday, we stuffed chard leaves with a pork/beef/veal farce (stuffing) and poached them. I'm certain there will be photos of that on Ken's blog (and here they are). And the plants continue to produce! We're in chard heaven. Add to that our frozen mustard greens and collards and you can see we'll be getting our minimum daily requirements of greens for some time to come. This is the first year that we've tried pole beans in the garden. One year we tried runner beans when a British friend brought us some seeds. Usually we plant bush beans, either green or yellow. Pole beans beginning their climb. One of our readers, an American named Carolyn, was kind enough to send us some pole beans (as well as several tomato varieties) from a seed producer she likes. So into the garden they went this spring! Now they're up and climbing their poles and putting out blossoms. 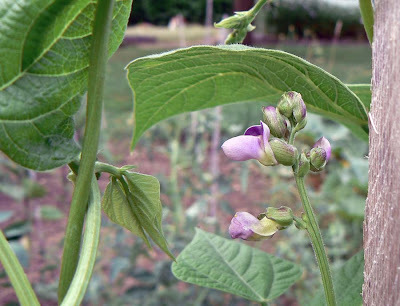 Beautiful purple blossoms will lead to yummy beans. I have five poles with three to four bean plants per pole. I can't wait to get our first crop. We already have our first yellow beans ready to pick, and we're still waiting on the limas. Thanks, Carolyn, for the seeds! One year we planted coriander in our vegetable garden. We love the leaves, called cilantro in the US, for Asian and Mexican dishes. It grew great, but we quickly discovered the problem with this tasty herb: it goes to seed very, very quickly. Our garden coriander is already in flower. 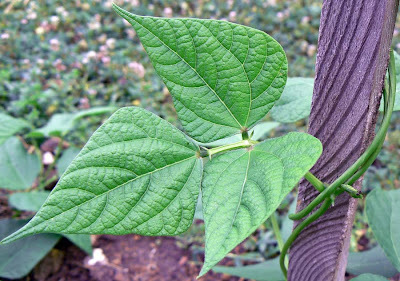 As the plant prepares to flower, the leaves it grows become very narrow and they loose some of the characteristic pungent flavor that the lower, broader leaves have. 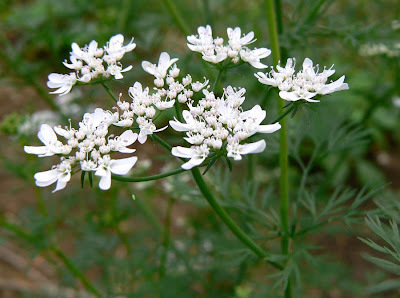 The trick, therefore, is to plant successive crops, so that there is always some fresh coriander coming up. Of course, I haven't gotten it together to do this and I'm still relying on the volunteers that pop up in the garden every year from the previous year's seeds. And they pop up in between the other vegetables that I'm growing. So this year I'm trying to pull out some of the coriander before it sets seed. I'll let some plants form seeds, but collect them rather than let them fall back into the garden. Then I'll plant them next year, hopefully using the successive planting strategy to ensure a longer, more useful harvest. No birds, no planes, and no sign of Superman. 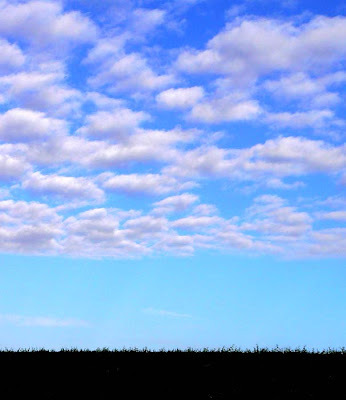 Still, the sky during my Saturday morning walk with Callie was amazing. We were under a layer of what I think were altocumulous clouds, and it was moving off. The edge of the cloud mass over the vineyard. I could see the edge of the cloud mass. While I was still in relative shadow, I watched the sunlight advancing toward me. It wasn't all that dramatic, but I thought it was pretty. Now, as I type this, the clouds are long gone and the unobstructed sunlight is heating up the day. Cherry time is just about over. But for those willing, there are still cherries on some of the trees. The birds haven't yet finished them off. Many are way up high, but some are still reachable. What may be the last clafoutis of the season. Ken went out on Thursday and picked a basketful around the neighborhood (where we have permission or where the tree is abandoned). And I made the classic French dessert: clafoutis de cerises (klah-foo-tee duh sir-eez). This is our third or fourth one so far this year. It's a very simple egg custard that you pour over the cherries and bake: three eggs, 125 grams sugar, 80 grams flour, 1/4 liter milk, a tablespoon of melted butter, and a dash of kirsch. 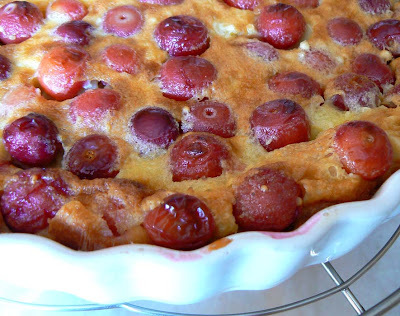 Since we try to eat with the seasons, we only have cherry clafoutis at this time of year. 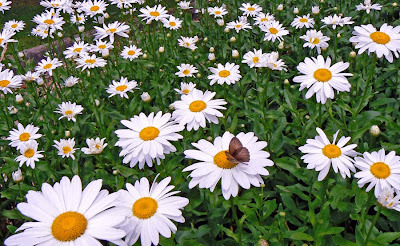 At some point during the past week, when I wasn't looking, our stand of tall daisies burst into bloom. I must have missed the memo. The daisies have come out! They'll be beautiful for a couple of months, then they'll start to die back and I'll put off trimming them until late fall. This is a pattern of mine. But you will forgive me this, because I have wood to cut for the winter, and a humongous hedge to trim in the fall. And the butterflies are enjoying the feast! While the daisies are blooming, the show is quite nice. And the bees and butterflies love them. We've transplanted some with the hope of having a new stand out back by the fence. I think it'll take a few seasons to get what we want, but we have time. The days are hot and long right now. It's very nice, and I'm resisting the temptation to complain about the heat. It's really not that hot, and the humidity is not oppressive. I know when this heat breaks I will miss it. The latest guests on the "Deck of Fame" were Alana and her mom Sherrie on Tuesday evening. 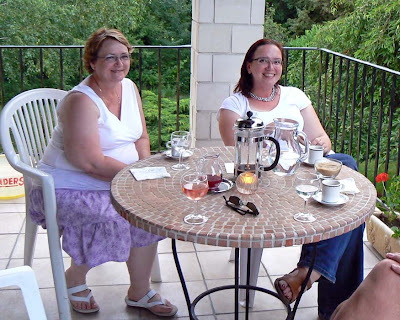 Ken became acquainted with Alana through the Slow Travel France forum where he participates regularly. She and Sherrie are spending two weeks in the Loire Valley and a week in Paris this summer. Sherrie (left) and Alana. Don't they look like sisters? 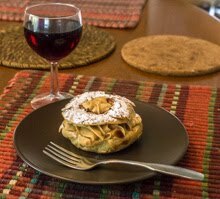 Alana lives in Northern Virginia with her husband and they both enjoy traveling and France. You can read about some of their adventures on Alana's blog here. 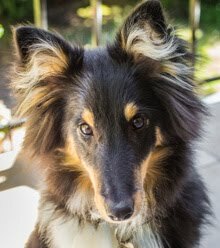 Sherrie lives with her husband in the Pacific Northwest, just outside of Portland, Oregon. It was a lot of fun getting to know them both and we enjoyed their visit. We had drinks out on the deck, as you can see, along with some olives and home-made hummus spread on toast. The evening was warm and the time went so quickly that before we knew it it was after eleven! We hope they continue to enjoy their adventures in our region and have a great time in Paris next week! So here's a lame post. 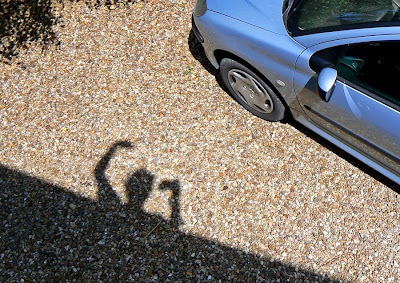 I took yet another picture of my shadow. At least I know it's still with me, so I will stay forever young, like Peter Pan. Yeah, right. Second star to the right and straight on 'till morning. Here's hoping your shadow never gets away from you!